Sarah comes to OmniStar Financial Group after developing her skills in client services with a respected wealth management firm in Marietta, GA. Sarah graduated with a Bachelor Degree of Business Administration from the University of West Georgia and earned her Series 65 License, as well as the North Carolina Accident and Health Insurance License. 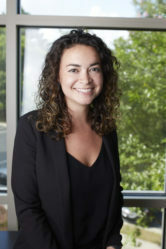 Her quest for knowledge and expertise in the financial services industry continues as she works towards her Certified Financial Planner designation through Wake Forest University. Sarah embraces the client centric culture of OmniStar and confidently believes her experience is perfectly aligned with OmniStar’s tradition of unparalleled client relationships. As a resource to OmniStar’s family of clients, Sarah will focus on operations and financial planning. Away from the office, Sarah is an avid runner and also enjoys reading, but her favorite pastime is spending time outdoors with her husband and miniature dachshund, “Man”. She is active in the community and enjoys giving back through her favorite charities.